Spotless 2015 Audi A3 TDI Premium * Massive Factory Warranty * Incredible Mpg * Instant Financing! 27,136 Orig. 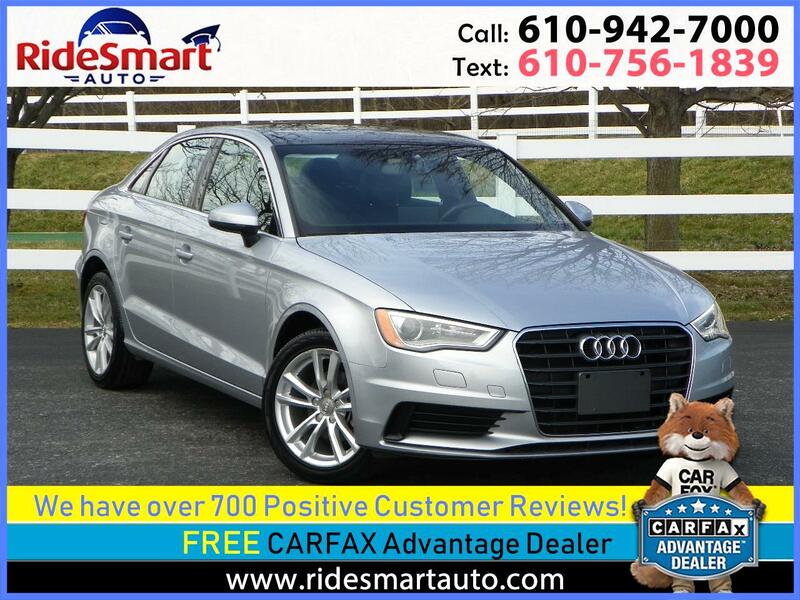 Miles, Carfax Certified (Accident Free) - 100% Spotless 2015 Audi A3 TDI Premium * Massive Factory Warranty * Incredible Mpg * Supreme Comfort & Safety * Unsurpassed Longevity! 2 Keys * Books * Floor Mats * New PA Safety Inspection. Just Like Brand New! PREMIUM SOUND SYSTEM * MOON ROOF * AUTOMATIC TRANS * LEATHER HEATED SEATS * POWER WINDOWS-POWER LOCKS-TILT/TELESCOPIC STEERING WHEEL- CRUISE CONTROL- POWER DRIVER SEAT- HEATED SEATS A/C AM/FM/CD AUX PORT- BACKUP CAMERA-ALUMINUM RIMS... BEST VW WARRANTY EVER...EXTENDED TDI WARRANTY UNTIL 2026 OR UP TO 162,000. MILES! SMARTEST PRE-OWNED CAR VALUE! The warranty period for the “Extended Emissions Warranty” limited warranty extension shall be the greater of:11 years or 162,000 miles, whichever occurs first, from the vehicle’s original in-service date; OR 5 years or 60,000 miles, whichever occurs first, from the date and mileage of Phase 1 of the emissions modification. At the time of the subsequent Phase 2 modification, the extended warranty will be honored for 5 years or 60,000 miles, whichever occurs first, from the date and mileage of the completion of Phase 2. The vehicle’s original in-service date is defined as the date the vehicle was delivered to either the original purchaser or the original lessee; or if the vehicle was first placed in service as a “demonstrator” or “company” car, on the date such vehicle was first placed in service. Under Extended Warranty The emissions system warranty shall cover the following parts or systems: The entire exhaust after treatment system, including the Diesel Oxidation Catalyst, the Diesel Particulate Filter, the Selective Catalytic Reduction converter, the dosing injector and other Diesel Exhaust Fluid system components, the exhaust flap, and all sensors and actuators. The entire fuel system, including fuel pumps, high pressure fuel rail, fuel injectors, vibration damper, pressure control valve and all sensors and actuators. The EGR system, including EGR valves, EGR cooler, EGR filter, EGR temperature sensor, all related hoses and pipes, and all sensors and actuators. The turbocharger, including the turbocharger damper. The On-Board Diagnostic (OBD) system, including SCR DEF quality sensor, and any malfunctions detected by the OBD systems other than those related to the transmission. Additionally, the engine long block warranty shall cover the engine sub-assembly that consists of the assembled block, crankshaft, cylinder head, camshaft, and valve train . The extended emissions warranty includes parts, labor, and applicable taxes. The extended emissions warranty shall not void or supersede any existing warranty. Conflicts concerning the warranty are to be resolved in favor of the consumer. More information about your extended emissions warranty coverage is available at www.vwdiesellookup.com. This extended emissions warranty is fully transferable to subsequent owners. If you are in need of automotive financing, please give us a try. We believe that you will be thoroughly impressed by our complete transparency and outstanding efficiency. Your financing transaction can be completed on the spot in minutes. If you’d like a pre-approval, apply online directly from our secure financing application on our website at www.ridesmartauto.com. It couldn’t be any easier. We’ve simplified your automotive financing experience making the process super easy and very informative! All Of Our Vehicles are Carfax Certified. All Transactions are 100% Transparent. We Show You Everything From Internal Workings of Finance To All Service Work Completed by our shop. Balance of Transferable Manufacturer's Warranty Minimizes Risk of Ownership. Extended Service Contracts Available For Long Term Security. Brand New PA Safety Inspection with Thorough Reconditioning consisting of New Oil Service, New Wiper Blades, Repair any significant Door Dings,Complete Interior & Exterior Detailing. Easy, Complete, All In One Transaction Including Competitive, Instant (on the spot) Financing, *Title/Tag Work, Delivery & Shipping (at additional cost). Aggressive Pricing Policy Assures You're Always Receiving Your Best Deal & Value. Liberal Trade-in Policy Offering Excellent Market Value, Eliminating Inconvenience of Private Sale, Providing Trade Sales Tax Credit. Trusted Dealer with 30+Years Experience & Nearly 700 Positive Customer Reviews & Growing! Every Customer is Treated With Respect & Appreciation. Outstanding Referral Compensation Program. We Will Pay You $150.00 For Every Buying Referral. We Not Only Tell You How Much We Appreciate Your Referral Business, We Pay You! SEE OUR OVER 700 POSITIVE CUSTOMER REVIEWS. YOU CAN ALWAYS BUY WITH 100% CONFIDENCE HERE! SUPER EASY ON THE SPOT FINANCING. WE HAVE SUCH NATIONAL LENDERS AS ALLY BANK, MEMBERS 1ST FEDERAL CREDIT UNION, SANTANDER CONSUMER USA & WELLS FARGO AUTO READY TO LEND PROVIDING SIMPLE & EASY TO UNDERSTAND FINANCING FOR YOUR PURCHASE. WE'RE READY TO WELCOME YOUR BUSINESS! WE LOVE TRADES! WE BUY CARS & TRUCKS TOO! GIVE US AN OPPORTUNITY TO PROVIDE YOU WITH YOUR BEST AUTOMOTIVE BUYING EXPERIENCE EVER! DISCLAIMER: RideSmart Auto, LLC is not responsible for errors in options or trim levels displayed on vehicle listings. The information is deemed to be correct to the best of our knowledge. It is the customer's responsibility to verify all options, trim levels, and any/all other pertinent information involved in favor of the vehicle transaction and before signing the final buyer's order. DISCLAIMER: RideSmart Auto, LLC is not responsible for errors in options or trim levels displayed on vehicle listings. The information is deemed to be correct to the best of our knowledge. It is the customer's responsibility to verify all options, trim levels, and any/all other pertinent information involved in favor of the vehicle transaction and before signing the final buyer's order. Sale price does not include sales tax, titling fees, extended service contract costs or any aftermarket products. We are not responsible for errors, omissions or changes to vehicle history report information. The legal venue for any & all transactions with RideSmart Auto & it's affiliates is Honey Brook, Chester County, PA.